The plot of the animated production is in most respects similar to that of the book; but certain plot points are significantly compressed or removed due to the time limitations of the format. In addition, certain scenes are obviously edited for commercial breaks. In general, alterations are confined to simple omission of detail, and the story follows the source text. The lyrics of the songs are adapted from songs in the book, but are generally longer. Production Designer – Arthur Rankin, Jr. The film was produced and directed by Arthur Rankin, Jr. and Jules Bass of Rankin/Bass Productions and was adapted for the screen by Romeo Muller, with Rankin taking on the additional duties of production designer. When interviewed for the film, Rankin declared that he would add nothing to the story that wasn't in the original. The New York Times reported that The Hobbit cost $3 million. The story's hero, Bilbo Baggins, is voiced by Orson Bean, backed up by noted Hollywood director and actor John Huston as the voice of Gandalf. In supporting roles, the comedian and performance artist Brother Theodore was chosen for the voice of Gollum, and Thurl Ravenscroft performed the baritone singing voices of the goblins. The gravelly voice of the dragon Smaug was provided by Richard Boone, with Hans Conried as Thorin Oakensheild, rounding out the cast of primarily American voice actors. The Hobbit was animated by Topcraft, a now-defunct Japanese animation studio whose animation team would re-form as Studio Ghibli under Hayao Miyazaki. Topcraft successfully partnered with Rankin/Bass on several other co-productions, including The Last Unicorn. According to Rankin, the visual style of the film took its basic cue from the early illustrations of Arthur Rackham. While Topcraft produced the animation, the concept artwork was completed in the US under the direction of Arthur Rankin. The Rhode Island-based artist Lester Abrams did the initial designs for most of the characters; Rankin had seen Abrams' illustrations to an excerpt from The Hobbit in Children's Digest. Principal artists included coordinating animator Toru Hara; supervising animator/character designer Tsuguyuki Kubo; character and effects animators Hidetoshi Kaneko and Kazuko Ito; and background designer Minoru Nishida. The same studio and crew members were also used for The Return of the King. Harry N. Abrams published a large coffee-table illustrated edition of the book featuring concept art and stills. Jules Bass primarily adapted Tolkien's original lyrics for the film's musical interludes, drawn primarily from the songs that feature prominently in the book. He also assisted Maury Laws, Rankin/Bass's composer and conductor-in-residence, in the composition of an original theme song, "The Greatest Adventure (The Ballad of the Hobbit)", sung by Glenn Yarbrough as the sole original song written for the film. This folk ballad came to be associated with Yarbrough, who reprised it in the soundtrack to 1980 animated film The Return of the King. The Hobbit first aired as an animated television special in 1977 with the goal of producing an accompanying tie-in storybook and song recordings for children, as in other Rankin/Bass productions. 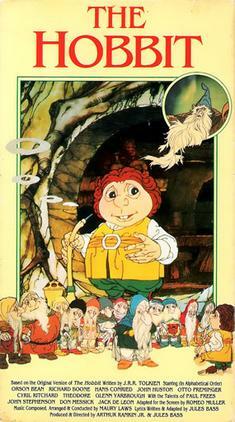 The Hobbit was released on LP with the soundtrack and dialogue from the film was also released in 1977 by Disney through its Buena Vista Records label, and an edited version, along with accompanying "storyteller read-alongs", was later issued for the Mouse Factory's Disneyland Records imprint. A second music album by Glenn Yarbrough of music "inspired" by The Hobbit was also released. In 1978, Romeo Muller won a Peabody Award for his teleplay for The Hobbit. The film was also nominated for the Hugo Award for Best Dramatic Presentation, but lost to Star Wars. A few days before its first airing, John J. O'Connor wrote in The New York Times that "Rankin and Bass Productions have now carefully translated 'The Hobbit' into film. The result is curiously eclectic, but filled with nicely effective moments. […] The drawings frequently suggest strong resemblances to non-Tolkien characters… The goblins could have stepped out of a Maurice Sendak book. But […] the Dragon and Gollum the riddle aficionado bring some clever original touches… Whatever its flaws, this television version of 'The Hobbit' warrants attention." Critics primarily focused on adaptation issues, including the unfamiliar style of artwork used by the Japanese-American co-production team, whereas some Tolkien fans questioned the appropriateness of repackaging the material as a family film for a very young audience. Douglas A. Anderson, a Tolkien scholar, called the adaptation "execrable" in his own introduction to the Annotated Hobbit, although he did not elaborate; and a few critics said it was confusing for those not already familiar with the plot. On the other hand, critic Tom Keogh praised the adaptation as "excellent", saying the work received "big points" for being "faithful to Tolkien's story" and that the "vocal cast can't be improved upon." Review aggregation website Rotten Tomatoes, which compiles reviews from a wide range of critics, gives the film a score of 67% based on reviews from 15 critics. The film was also released on DVD by Warner Bros. as part of the DVD trilogy boxed set, which includes Ralph Bakshi's The Lord of the Rings and the Rankin Bass production of The Return of the King. The Warner Bros. edition DVD is now out of print, though a remastered deluxe edition DVD was released on July 22, 2014. Sound effects missing in previous DVD releases are absent from this release as well. Before The Hobbit ever aired on NBC, Rankin/Bass and its partner animation houses were preparing a sequel. Meanwhile, United Artists released J.R.R. Tolkien's The Lord of the Rings in 1978, an animated adaptation directed by Ralph Bakshi, originally intended as the first part in a two-part film. United Artists's sequel having been cancelled after a disagreement with Bakshi, Rankin/Bass proceeded to produce a television installment of The Lord of the Rings, bringing back most of the animation team and voice cast. Taking elements from the last volume of The Lord of the Rings which had not been used by Bakshi, they developed the musical The Return of the King. They were unable to provide continuity for the missing segments, developing instead a framing device in which both films begin and end with Bilbo's stay at Rivendell, connecting the later film directly to the better-received Hobbit. ^ The film has a running time of 77 minutes; several Internet sites list the full 90 minute air time. ^ E.g. goblets clanking and hammer-tinkering noises omitted, spider death screams, along with several lines of dialogue. ^ a b c d e f g h i Culhan, John. Will the Video Version of Tolkien Be Hobbit Forming? The New York Times, Nov 27, 1977. ^ Potter, Russell (2015). "A Tolkien Effort: The Story of the 1977 Hobbit Cartoon". Hogan's Alley. Vol. 20. ^ "Rankin / Bass Featuring Glenn Yarbrough – The Hobbit: Original Soundtrack Songs", Discogs. Retrieved on 9 August 2015. ^ Kask, TJ, "NBC's The Hobbit", Dragon Magazine, December 1977. ^ "Tomatometer for The Hobbit (1978)". Rotten Tomatoes. Retrieved 2018-11-18. ^ "Hobbit: Orson Bean, John Huston, Otto Preminger, Jules Bass, Jr. Arthur Rankin: Movies & TV". Amazon.com. Retrieved 2014-05-16. "Hobbit", CED magic (screen captures) from the CED edition. Also features links to galleries of screen captures from other Tolkien animated films.